I cannot begin to tell you the amount of paper we generate through both of us working from home and having 2 very creative kids, our recycle bin can be filled daily and bulges over! 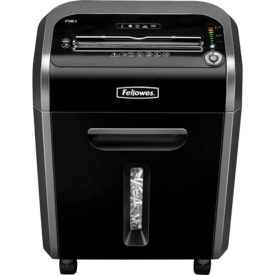 I have been sent this 79Ci paper shredder from Fellowes to review and it is perfect for a home office. I have to be honest traditionally shredders have made me very nervous. I worry about little hands getting caught in them The Fellowes 79Ci has some VERY clever solutions. It features new Patented SafeSense® Technology which stops the machine when hands are too close. This means I don’t have to worry too much about the kids. I am also not the most careful of paper sorters, staples and paper clips are a pain to keep removing and some inevitably get left on. This machine not only has the ability to shred paper but also CDs/DVDs, credit cards, staples and paper clips – how cool is that! Also the SilentShred® Technology minimises that horrible noise.ome shredders make. It can shred 14 pages in one pass and the pull out bin holds up to 320 shredded papers. Best of all it is 100% jamproof. I wish my printer was I’m always getting jams. All in all a VERY practical addition to a home office. Privacy is crucial and personal documents do need shredding as identity theft is on the rise. This shredder currently costs £225 on Amazon. Next Post MoneyVista an online personal finance plan.